Techmeme Search Feeds. Use 'Em, Love 'Em. Gabe Rivera finally added search to Techmeme last month. But already he is making it much better. Rivera just added a nice prospective search feature to the site. 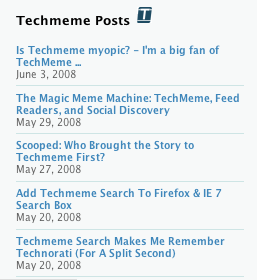 Anytime you search Techmeme, you can subscribe to future search results for the same term through an RSS feed. Just click on the RSS icon in your browser after you do a search, and you will get a feed for stories that appear on Techmeme with that term. So you can keep track of breaking Techmeme news about that particular subject in your feed reader. By default, the feed only includes stories with your search term in the headline or first few sentences, but you can opt for any mention of the term throughout the story as well. This is a good way to keep track of breaking news on companies or products. For instance, you could subscribe to a feed for the term “iPhone” or “Google” or “Twitter.” In fact, we already incorporate a Techmeme feed for this very purpose in our Crunchbase profiles. (The image above is the latest feed in the sidebar of Techmeme’s page).